I also published a similar blogpost to SavingsPinay! Recently I've been stalking the blog of Michael Hyatt. He is a well-known blogger entrepreneur that focuses in intentional leadership. I stumble upon his blogpost on creating an ideal week. That post truly motivated me to create mine. The idea of creating an ideal week is allowing yourself to plan how you would like your week to be if and then you have 100% of your time. It was the very thing that I needed since as you may know I an filled with ideas that will soon be commitments thus occupying a space in my daily time expenditure. Mr. Hyatt is very generous to have the template free to download so you can do it here directly. Do read too his blog post for premier understanding about creating your ideal week. I also used his template as a basis in creating mine so I assure to you the importance of reading that said post. So here's screen shot of what my ideal week is. 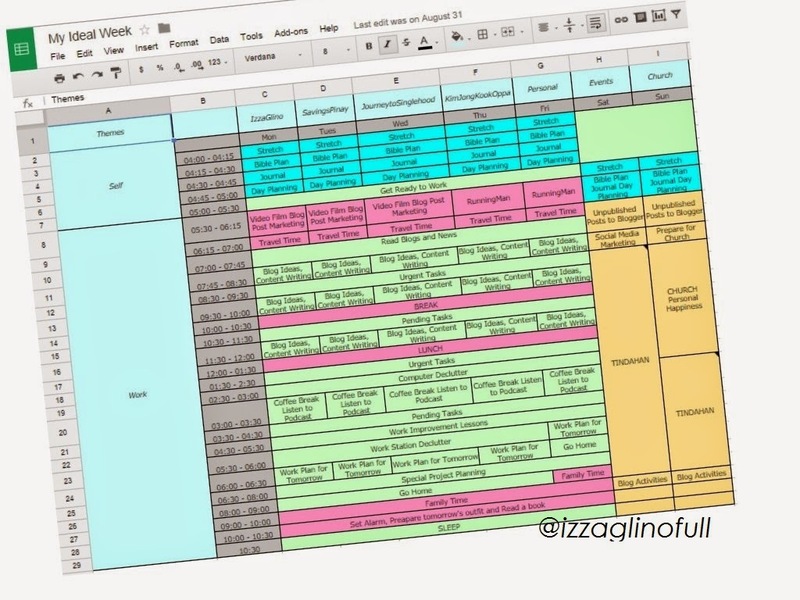 This is purely based on Sir Michael's Ideal Week template. So to explain I've got three main columns in my template. The first column is for my main theme. I've written self and work as the main theme categories of my daily life. Notice how Self is in the morning or the earliest time of my day. This is setting a priority of hierarchy towards my intentions. The second column is for my time. I set it mainly as how I overview it to be and thankfully it matched what my routine is. I wake up at 4am and end my day at 10:30pm. The intervals are mostly 1 hour to 1 and a half hour per activity. The last column is composed of the days of the week. You have the choice to which day you will start. Mine is Monday and ends in Sunday just like a normal calendar. On the top row I included the focus of my day. This is important because I set what I do on that day and accomplish the tasks mostly related to my focus. This way I get more things done. You can also notice that in my weekdays I purposely included 30 mins for blog ideas and content writing. This is my form of break during work. Too much technical writing can be very stressful for me so I take a time off but I see to it that it is for productivity only so what I do is try to relax and compose ideas on what to write next. I can also finish an outline for an article. This is also my way of creating a work-life balance. Urgent tasks and pending tasks are both work related. If the work is really busy, I go back to my first column as says in my main theme is work and use the time I reserved for blogging to working on documents and system manuals. My Saturday is reserved for Events which is my hosting gigs. If I don't have a gig on a particular date, I then do exactly on what’s written on my ideal week that you see which in this case is going to our store (family business) to help. I also do all of the facebook marketing, video editing and blog posting (I schedule all contents I created during the weekdays) on this day. My Sunday is Church and other personal engagements and family quality time. I also reserve some time for blog activities too. When you have a template on what your day is, it is very natural for you to live by that standard. Before I created this ideal week I procrastinate at work and really devote all of my time and energy to time-wasters. I feel so unproductive that I don't finish anything that I started. But with this ideal week I realized that I can balance my life, my work and my hobby if only I give my 100% attention one item at a time. I learned the value of morning routines and how to wait productively. This is a primary tool to be a master of time and to live by your purpose. I hope this post helped you. Comment below what do you think of this creating your ideal week method. Also share to me what your ideal week is. Thanks and God bless. So I took a video of myself actually getting paid $500 for participating in paid surveys to set the record straight.